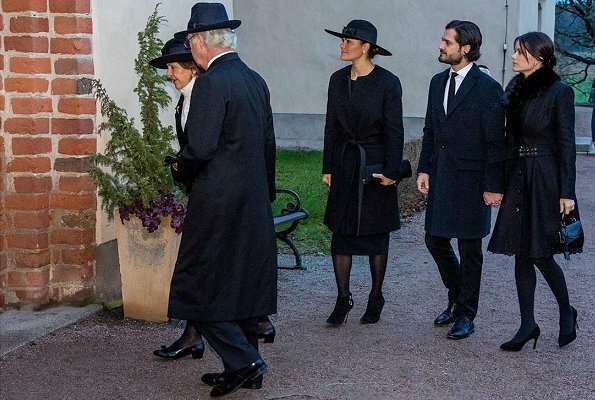 On December 2, 2018, King Carl XVI Gustaf, Queen Silvia, Crown Princess Victoria, Prince Carl Philip and Princess Sofia attended the funeral of Count Oscar Bernadotte af Wisborg, held at Rasbo Church in Uppsala. Count Oscar Bernadotte af Wisborg was a second cousin of King Carl XVI Gustaf’s father as well as of King Harald V of Norway, King Baudouin I of Belgium and the late Queen Ingrid of Denmark. Count Oscar 'Oscis' Bernadotte af Wisborg died at the age of 97 on the 2nd of November. I like Sofia´s look here. That´s a very attractive silhouette. Victoria on the other hand is a perfect display of how the wrong hem length throws off any balance. Her longer skirt make her legs look stumpy, and the booties only aggravate this. Her coat and hat are nice. Everyone looks appropriately dressed for the occasion of course. Victoria needs a white scarves or similar to make the outfit less severe, I get cold just looking at her! Madeleine misses out such occasions, sadly. Nice look all around.A nother sad occasion for the family. Where is Sophia’s hat? She should have worn one. It is the appropriate attire. Her silhouette indeed looks better than Victoria’s. Queen Silvia is elegant as always. Sofia rarely wears hats, she attended a funeral last year and didn't wear one. 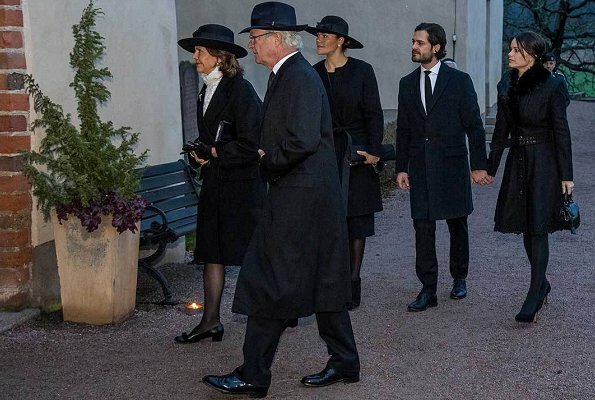 Swedish culture really doesn't deem not wearing a hat "inappropriate" to a funeral. It's optional for the ladies. They're not like the British. Sophia's outfit is perfect and well suited for her particular figure. Very flattering. Victoria's outfit is disappointing.